Also serving communities of River Ridge, Luling, La Place, Laplace. There are 28 Assisted Living Facilities in the Kenner area, with 3 in Kenner and 25 nearby. The average cost of assisted living in Kenner is $2,250 per month. This is lower than the national median of $3,346. To help you with your search, browse the 123 reviews below for assisted living facilities in Kenner. On average, consumers rate assisted living in Kenner 4.1 out of 5 stars. Better rated regions include New Orleans with an average rating of 4.4 out of 5 stars. Caring.com has helped 6 families in Kenner find high-quality senior care. To speak with one of our Family Advisors about assisted living options and costs in Kenner, call (855) 863-8283. Kenner, Louisiana, is located within the New Orleans metro area, providing easy access to ample cultural activities, such as visits to the French Quarter and the Aquarium of the Americas. Senior citizens who need help with the activities of daily living can choose from three assisted living communities within the city and another 28 in surrounding areas. These are all considered adult residential care providers and are governed by the Office of Aging and Adult Services. With more sunny days than the national average and mild winters, Kenner is a delight for many people. Winter lows only dip to around 44 degrees on January nights. The summers are hot and humid with the average highs in June coming in at around 91 degrees. The air quality in Kenner is 45, which is lower than the national average of 58. Some seniors who have respiratory sensitivities to environmental factors might have some struggles here. The cost of living in Kenner is 101.6, slightly higher than the national average of 100. However, health care is lower than the national average at 87. The grocery index is also slightly lower at 92.9. A lower-than-average violent crime rate might appeal to some seniors who are considering Kenner. The city has an average of 21.7, while the national average is 31.1. However, Kenner has a higher property crime rate of 47.8, while the national average is only 38.1. The Rivertown Arts Council maintains the Main Street Community, which highlights the beautiful historic district. Seniors can enjoy leisurely strolls through the area. Some assisted living communities might even offer day trips into New Orleans or to the area casinos. The Kenner area is home to world-class medical facilities, including Ochsner Medical Center — Kenner, in the event of medical emergencies or illness. Assisted Living costs in Kenner start around $2,250 per month on average, while the nationwide average cost of assisted living is $4,000 per month, according to the latest figures from Genworth’s Cost of Care Survey. It’s important to note that assisted living rates in Kenner and the surrounding suburbs can vary widely based on factors such as location, the level of care needed, apartment size and the types of amenities offered at each community. The Office of Aging and Adult Services and the Office for Citizens with Developmental Disabilities administers waiver programs that may help senior citizens to cover some of the costs of assisted living. These include the Community Choices Waiver and the Supports Waiver. Kenner and the surrounding area are home to numerous government agencies and non-profit organizations offering help for seniors searching for or currently residing in an assisted living community. These organizations can also provide assistance in a number of other eldercare services such as geriatric care management, elder law advice, estate planning, finding home care and health and wellness programs. To see a list of free assisted living resources in Kenner, please visit our Assisted Living in Louisiana page. Kenner-area assisted living communities must adhere to the comprehensive set of state laws and regulations that all assisted living communities in Louisiana are required to follow. 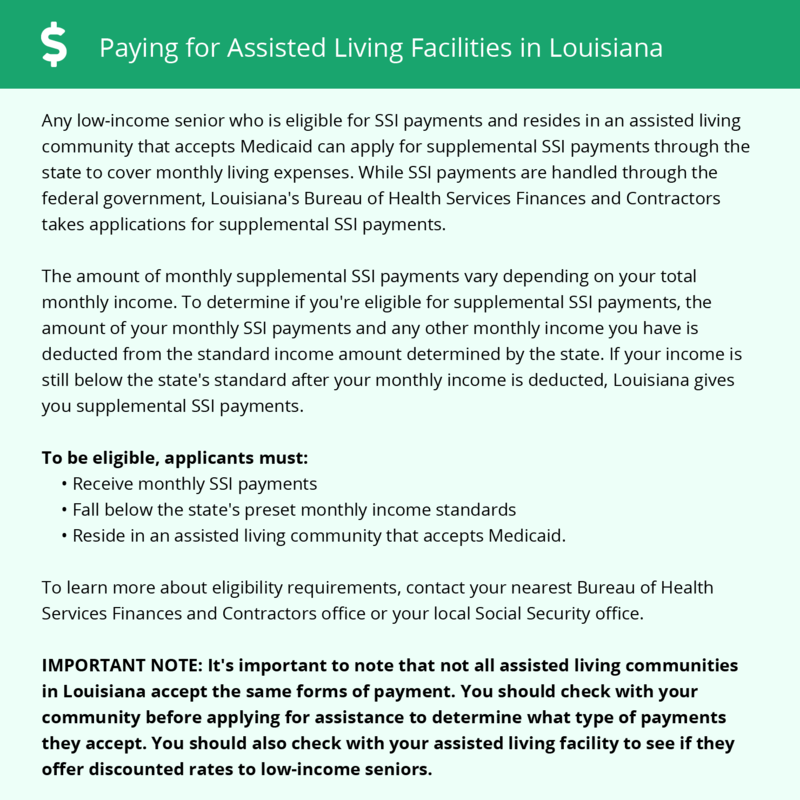 Visit our Assisted Living in Louisiana page for more information about these laws.